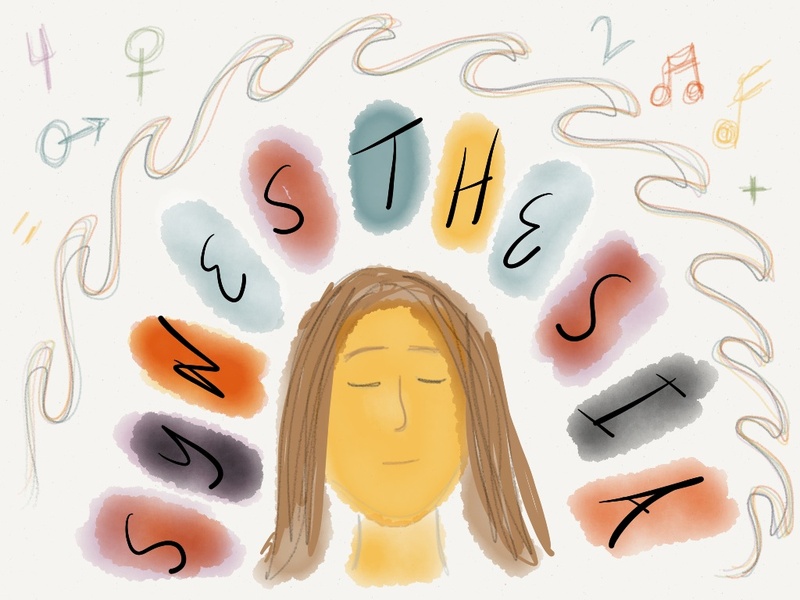 This morning I came across a new study in the journal PLoS One from researchers at the University of Amsterdam that involves creating synesthesia in non-synesthetes. After a lengthy chat with Einstein, my resident cognitive scientist, I can see now why it's important work; one result, one small crack in the pavement, leads to others. But as a homeschooling mother of a synesthete, my initial reaction was bewilderment. Why would you want to turn anyone into a synesthete? In my opinion, navigating such a thick world of sensory impressions makes everything harder. Everything. And then I realized that I've never actually talked about synesthesia in this space. Not even once, although my homeschooling thoughts have been consumed by it for a couple of years now. The more I learn about it, the more there is to learn. And the longer I homeschool, the more I realize how every part of the child comes into play in education, and nothing can be taken for granted or overlooked. Especially when it comes to the senses. Moonshine, my "middlest child" as she calls herself, is a synethete. In simplest terms, this means that when she senses one thing in the world, she has a strong and involuntary additional sense perception. Not exactly simple, is it? Synesthesia itself is very ill-defined. The range of cross-sensory possibilities is too large to fully identify and not always consistent between synesthetes. According to the wikipedia entry for synesthesia, there are so far over 60 reported synesthetic relationships. Who knows how many forms there truly are and to what effect any of them have on a synesthete's abilities to navigate through the world. I suppose that's what science is trying to figure out. As a homeschooling mother of a synesthete, I'm trying to figure out the same thing. Now that we've identified Moonshine's synesthetic tendencies, what part do they play in her education? Are they a hindrance? And if so, how can we turn them into a benefit? Like the researchers, my first task was to try to understand the parameters. This wasn't easy. I'm not sure that I still understand the scope of Moonshine's cross-sense perceptions, but the more common ones I have managed to identify. Or actually, she would argue that the color palette I used isn't quite right--the hue differences are inadequately represented and some of the color combinations I came up with (ie. dark purple) hardly come close. 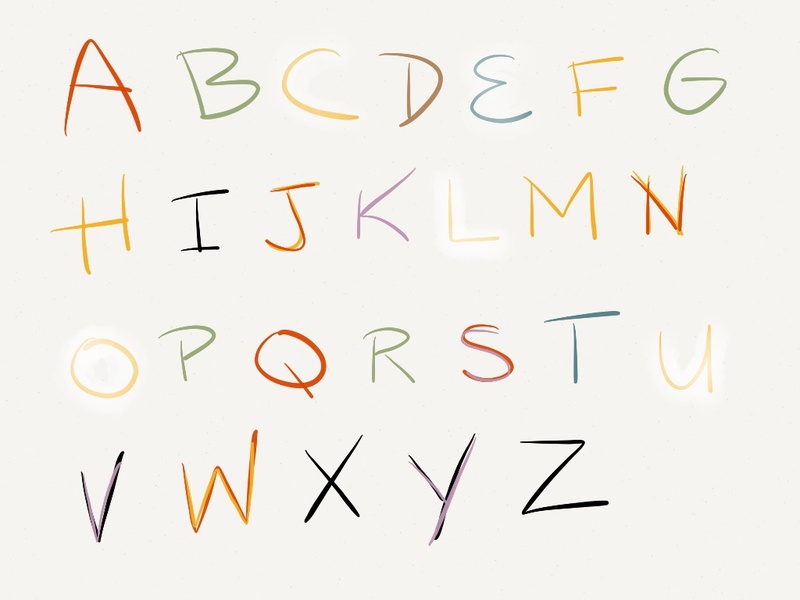 But overlooking the palette shortcomings, this is how Moonshine senses the alphabet. We've quizzed her randomly over a two-year period, and it's always the same, without fail. She senses numbers in color, too. The list goes on, and again, the hues aren't perfect representations. Luckily, she's forgiving and understands the palette limitations of the app I was using to recreate them. To me, it all seems fairly random. (While G is green, O isn't orange, P isn't purple, R isn't red, and B isn't blue. 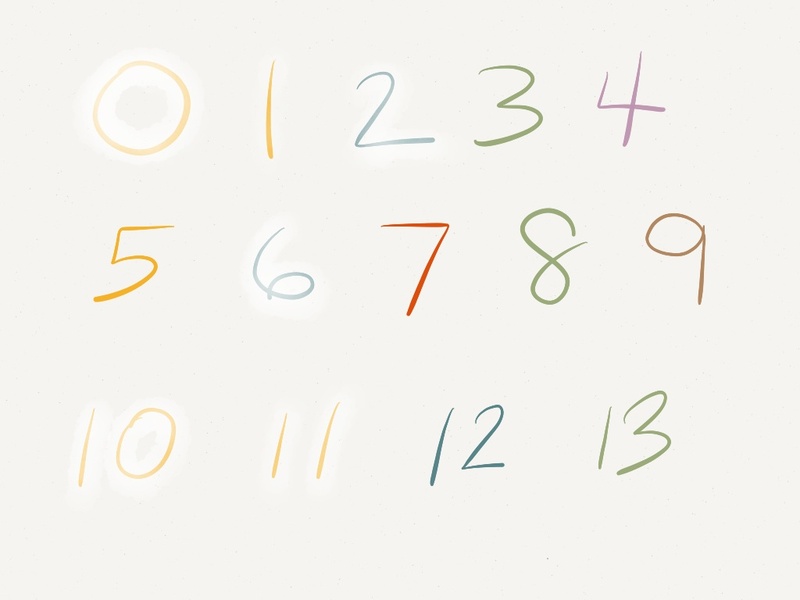 The numbers seem random as well, until you get to double digits, and then a pattern seems to emerge. 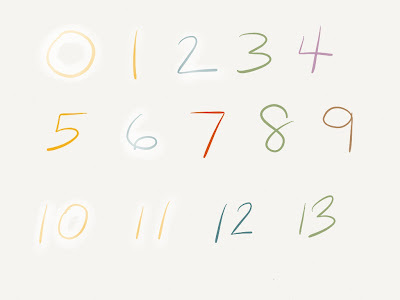 The teens seem to take on the color of the second number. Beyond that, they appear multi-colored, with the first color dominating the number, and yet not overpowering the other color(s) completely.) But to Moonshine, and other synesthetes, there is nothing random about it. This color perception is a "truth" that they feel to their very core. And of course, it's made even more interesting because while two synesthetes might agree on a few letter/color perceptions, no two will agree on all of them. And to take it a step further, some synesthetes actually see the colors when they are reading, while others only sense them inwardly. Now, if you're an educator, perhaps you have already begun to recognize how this sense perception might lead to difficulties, especially when it comes to reading or mathematics, and especially for those synesthetes who actually see the letters and numbers in color when they read. It might not make a whole lot of sense to synesthetes when the sum of two yellow numbers is actually a blue number. You can understand how the sense perception might dominate the equation, especially when combined with another form of synesthesia called personification. In personification, letters, numbers, colors themselves, months, days, even toilets might elicit a sense of personality and gender. For Moonshine, this is one of her truths that we face on a daily basis. 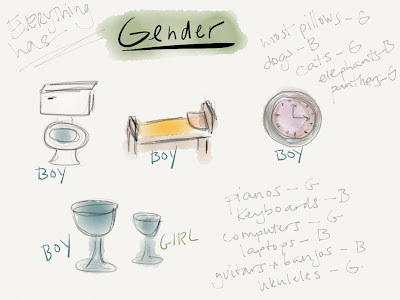 Almost everything is imbued with personality, gender, and color. It's fascinating and mystifying and completely overwhelming at times. 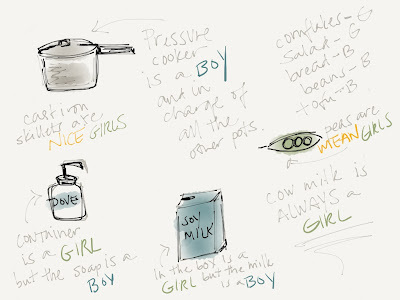 In my recent attempts to understand and explore this personification sense, I took notes. 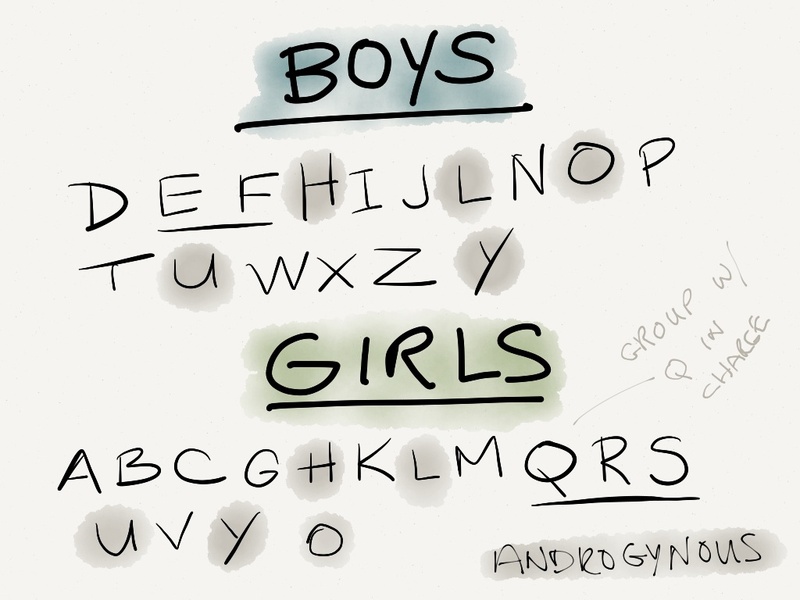 All letters have gender, though some of them are a bit androgynous. 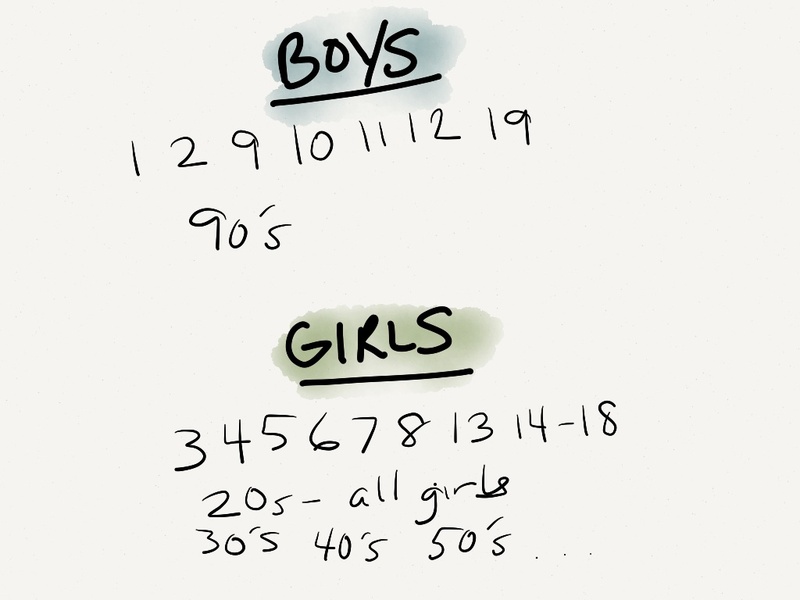 Although not a complete list, all numbers also have gender. For Moonshine, there is definitely a pattern to it when you get to double digits. 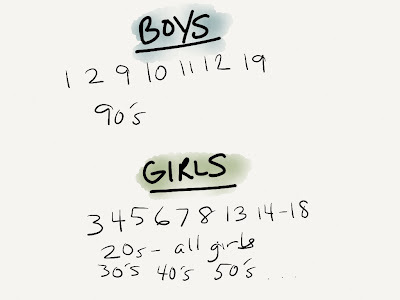 The teens go by the gender of the second digit, while the 30's and up go by the gender of the first digit. The 20's are girls, even though 2 is a boy. Go figure. Both letters and numbers have personalities as well. And again, these personality perceptions are automatic and intense-- they're nothing short of "truths" for synesthetes. I asked Moonshine to tell me about the ones that were most interesting. Here's what she told me. This is where it gets a little more confusing. I had to ask a lot of questions to fully understand what was going on here. In the first row, E and F love each other. Their relationship had stumped Moonshine for years until she discovered that some boys marry other boys, and then the relationship between E and F made perfect sense to her. They love each other as if they were married-- even if I did draw the heart in the wrong color (apparently hearts are red and they are not outlined in black). 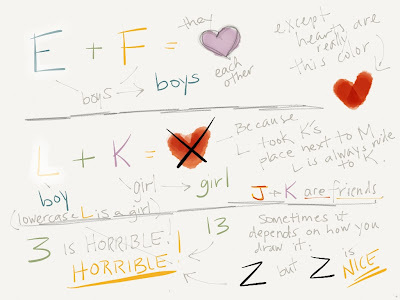 In the second row, it's clear that L and K are enemies. Moonshine had me write the gender names in their correct colors. Boys are blue, girls are green. Apparently lowercase L is a girl, which takes us back to the androgynous business. You can also see that the symbols (+, =) have color representations. The third row is interesting because both 3 and 13 are horrible, and while both numbers are green, horrible is a yellow word. 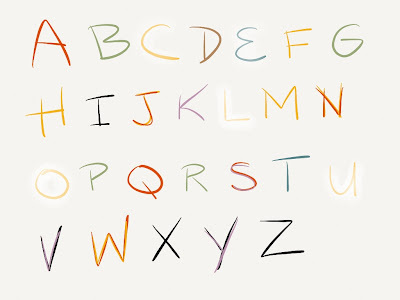 While letters have independent colors, words tend to take on the dominant color-- it's almost like a math equation of sorts. To me, it's something I have to go and add up-- 3 yellows, 3 greens, 1 light blue, 1 black-- uh, okay, maybe yellow dominates because it starts with a yellow? But to Moonshine, it's automatic. She doesn't stop and count-- she senses the word as yellow without thinking. The drawing of Z is also fascinating, because the personality changes with the angle of the top line. This is not something I would have ever thought about had she not pointed it out to me. Because we're doing Waldorf education at home, it brings up so many questions I have about sense perceptions of different form drawings. 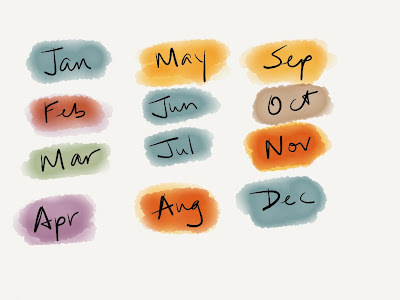 Just as letters and numbers elicit colors and personalities, so do months. Fascinating, no? I noted an inconsistency where Moonshine told me that Purple (a 2yo girl) is the youngest, but then informed me in the next breath that Yellow is a baby. Maybe you're wondering about that, too. In any case, I'm told that Purple is the youngest child-- and babies don't really count in that ranking system. Babies are babies. But what about toilets? I told you that some synesthetes perceive personification with everything. And by everything, I meant just that. My drawing of the large and small wine glasses isn't so great, but I think you get the general idea. 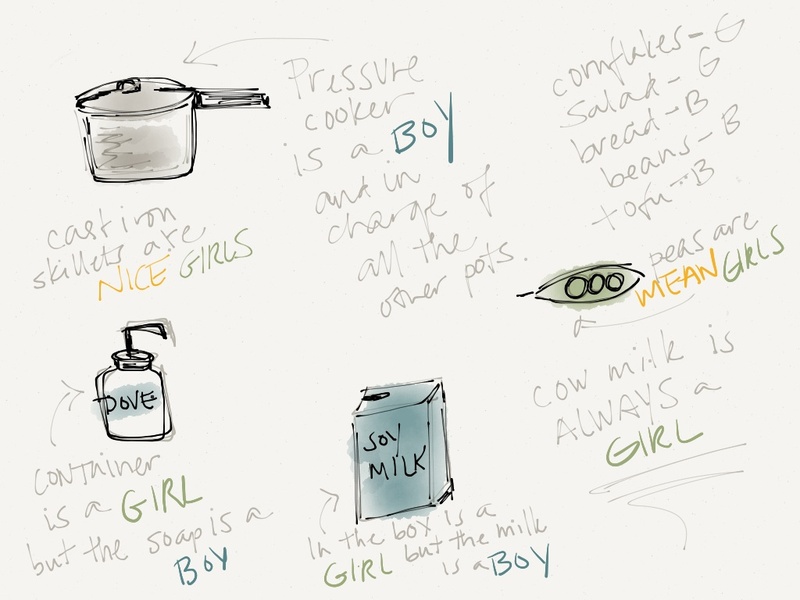 And if all of that wasn't fascinating enough, food and soap also have gender and personalities. Peas are mean girls?!! It is enough to make my head spin at times. And if everything is imbued with sense perceptions for Moonshine, including music, what do you think that does to her learning? There is an effect for sure. She has always been dreamy, but now I can't help but wonder how much of that is her navigating these automatic sense perceptions. In my mind, it must be a noisy sea of color that she has to wade through whenever she's faced with anything-- from words she reads or ones I read to her, to math problems, to music and foreign language (in which words present in different colors than in English), to spelling... it's endless. And how much of that time is spent trying to make peace with things in the wrong color? She points them out to me in the world. Just yesterday we were shopping for clothes, and Moonshine remarked that the sizes (numbers) were color-coded in the wrong colors. And when something is represented in the correct color, it's almost a relief to her. When she tells me about it, it's as if her whole body relaxes, and she often wonders aloud, "How did they know to make it green or yellow or...?" In hindsight, this explains so much about how Moonshine experiences the world-- why she fell apart at age two when we changed the color of our roof; why two seemingly identical purple balloons are very different; and why having to change her shirt in the middle of the day is a shock to the system. For Moonshine's synesthesia, this is just the tip of the iceberg. There is still more to come. I enjoy this condition also and it makes my mind boggle that there are people who don't. It's hard to explain in simple words some of the synaesthetic relationships - for example, the emotional edges of letters and the personalities of numbers (ie, 5 is unfriendly - and yet brown, whereas brown is generally a placid friendly colour, a kind of dog of a colour). Others are simpler (although they may life ... um, interesting) such as personification of objects. Made drying the dishes take forever when I was a child, because I worried so much about each fork and spoon! My daughter is also a synaesthete. It's interesting to me that her colours and tastes for things are different from mine - same as I don't agree with Moonshine's assignations. My dd had to change the spelling of her name because it tasted wrong and was the wrong colour! I love that you are taking this into account when educating your girl. I can imagine how hard it must be, especially if you don't share that understanding. I am constantly fascinated by it, Sarah. 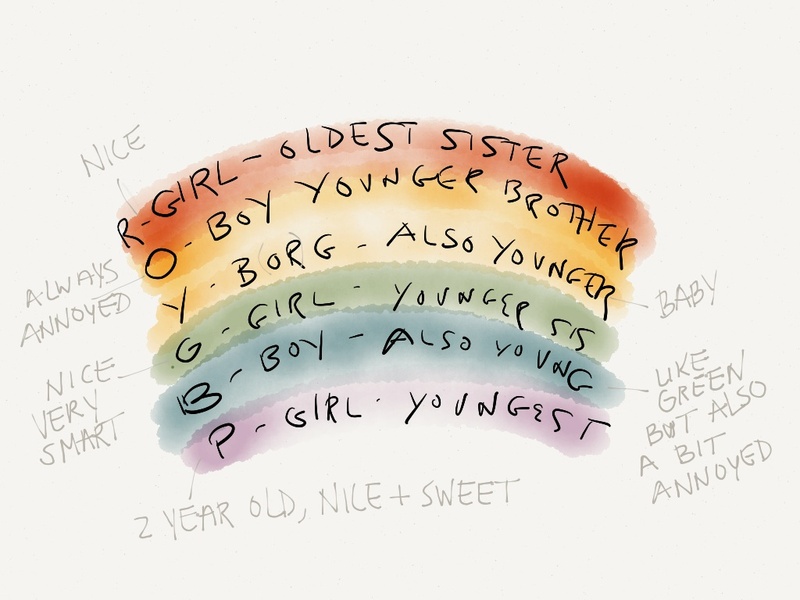 How interesting that your daughter's name tasted wrong-- and how lucky she is that her mother is also a synesthete. Imagine being a child trying to explain that your name "tastes wrong" to a non-synesthete parent. Eek! The inconsistencies are also interesting to me-- like you noted with your sensing of number 5. It seems that for everything I learn, I am filled with even more questions. We had an interesting bit of synchronicity here yesterday. After reading your post my son took out "The Runaway Dinner" by Alan Ahlberg. This was my son's favourite book when he was about 3 years old. Being ex-pats we are big fans of the Ahlbergs who are so very English, so despite having outgrown these books really I just couldn't part with them.......but we hadn't read this book in a long, long time. I really enjoyed your post and this subject is fascinating to me - how rich Moonshine's experience of the world must be! I have never heard about this. Interesting! Miriam sometimes talks about music sounding like a certain color, but I don't know if she has any other connections like that. Eva, that would be very interesting to know if Miriam experiences this as well. I have never heard of synesthesia. When I popped over to the wikipedia link to read more, I was fascinated that there were books written about people with this condition. I can see how difficult that would make learning at times! I am a synesthete homeschooling a synesthete. Mine will be glad to see that he is not the only one who thinks 3s are horrible! Hi Paula, thanks so much for commenting. Moonshine is happy to hear that someone else "knows" that 3 is horrible, too. I would love to hear about your adventures in homeschooling with synesthesia. I am an educator of elementary students on the ASD spectrum... This is facinating... Kudos to you for educating you daughter and taking her uniqueness into account on all levels. this has to be hard work but very worthwhile to her future success.... God bless you. This is fascinating. I had a friend in college who said that every person she met had a color. I was neon green. I've lost touch with her, but I wonder if she had other color associations. 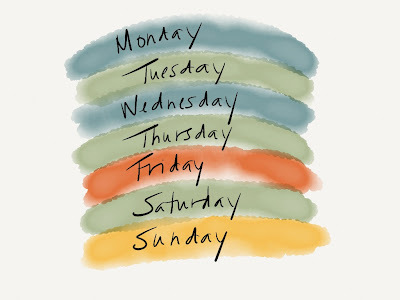 I clicked over to the wikipedia article as well, and read about how some synesthetes see days of the week and months of the year graphically, like on a map. Either clockwise or counter clockwise. I do that! 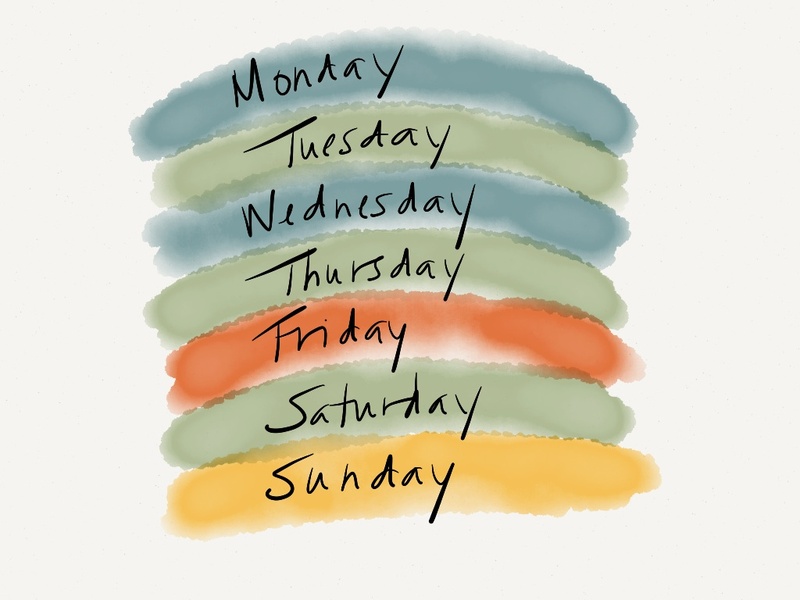 I see the days of the week on a perpetual wheel that rotates through my mind as I go through the week and sort of backs up or fast forwards if I look ahead or behind in the week. Same with months, but it's bigger. They go clockwise. So does that make me a synesthete I wonder? I don't have any of the other associations, etc. Is it possible to just have the one thing? It never occurred to me that it was different. I'm just curious. When did you first discover that your daughter was a synesthete and did you already know about synesthesia before that? How did you find out about it? Would love to hear more about it. Sounds like a beautiful gift, and a frustrating condition at the same time. Thanks for sharing. Caitlin, thanks for your comment. It really is fascinating stuff. How very cool that you see things graphically. From everything I've read, not every synesthete will experience every form-- so it is possible to just experience one aspect. I think synesthesia brings up more questions than science has answers for right now. I'm actually in the middle of writing a post on how we figured out Moonshine was a synesthete-- she has always been a little different in her responses to life. I think we finally knew what to call it two years ago when she was insisting that something was the wrong color. My dh, Einstein, works in cognitive science so he recognized it as synesthesia, but neither of us knew a lot about it then. I hope it's ok to do so but I'd like to Tweet this because I have a bunch of homeschooling and science-loving followers and they would be fascinated by your post. And who knows, maybe it'll even help some of those followers or their kids? My guess is that most synesthetes learn to cope and educating them isn't an issue. I think when you combine synesthesia with other hurdles, that's when it becomes a bigger part of the equation. So yes, feel free to tweet. Hopefully I can get another post up that addresses synesthesia combined with other things, because I think that as a topic would be even more beneficial. This book sounds fascinating. Thank you, Cathy.